The aircraft was one of a flight of eight deploying to the European Theatre of Operations through Presque Isle AAF, with the next destination of Gander Newfoundland. Shortly after the flight became airborne, it was learned that while the ceiling over the field was above the acceptable minimum, the entire surrounding area was not, so the aircraft were recalled. One plane "disappeared" but later landed in Gander safely. Six landed back at Presque Isle. This aircraft was witnessed by a farmer to come out of the ceiling in a steep dive and crash into a remote swamp, killing the crew of 7. The tail section had broken off and landed 1/4 mile from the point of impact. Loss of control due to disorientation was listed as the probable cause by the inquiry. A second B-25 crashed nearby later that day killing another 7 man crew. Two German sympathizers were later arrested for tampering with a B-17 at the base, leading to a local legend that these two Mitchells were the victims of sabotage. S/Sgt James Kviz; S/Sgt Eugene Crozier; S/Sgt Richard Riddle; Sgt. Fredrick Rowbottom. Wide shot of the impact crater. The direction of travel was from right to left. The aircraft impacted at high angle at high speed. 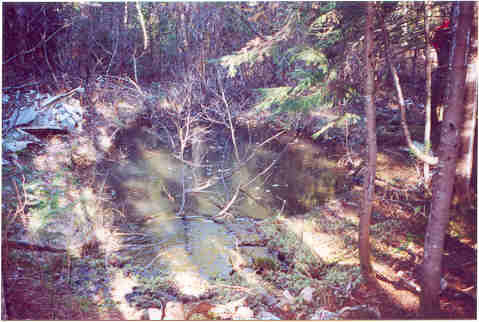 This site resembles a jet crash site, more so than a "typical" WW II era crash.